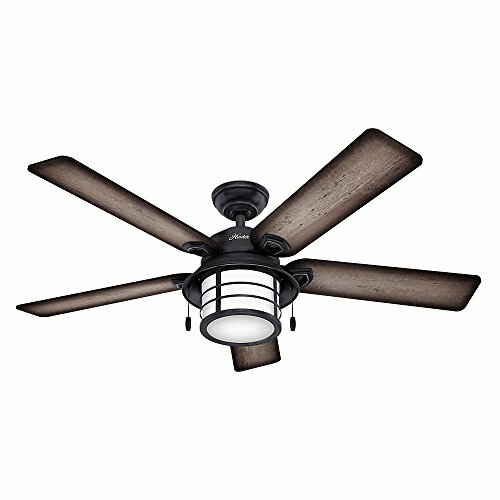 The Hunter Key Biscayne Ceiling Fan scored high marks in all categories and is our top pick. Hunter is a well-known and respected name in ceiling fans. The Key Biscayne is a quiet operating fan that provides plenty of air circulation without the rumbling noise they can create. This quiet operation is due to the whisper wind motor and makes this the perfect fan for the bedroom, office, or den where quiet is important. You’ll get plenty of power and wind output with this Hunter fan as well. The sleek design goes well with any décor. When it comes to purchasing a new ceiling fan, it helps to do a bit of prior research before finalizing your purchase. After all, this is something that will be hanging out in the open for all to see for many years on end. However, by knowing what to look for in a ceiling fan before going into a purchase, getting the right product is easy. We spent over 30 hours researching and testing 20 different types of ceiling fans and found that design, maximum wind output, and ease of installation were most important. In this review, we’ll cover three of the best ceiling fans currently in circulation based on a criteria of setting sensitivity, aesthetic appeal and maximum wind output. We’ll also follow up with a buyer’s guide, giving you some insight as to just what it is that makes a good fan good to begin with. The Hunter Fan 59135 Key Biscayne is marketed as being the best solution for those who love having a fan going somewhere in the house, though hate the constant rumbling created while said fan remains in operation. Through what the manufacturer refers to as a “whisper wind motor,” you can be sure motorized noises will never be an issue when you own this fan. Of course, this is a huge plus that we can all appreciate to some degree or another, whether or not the noise created by other fans has been an issue up until this point. Whether you’re having friends over or plan on keeping your fan around for a long time (to the point where many other fans may start to become somewhat noisy), it can’t hurt having something that operates quietly. However, don’t mistake its low level of noise for a low level of power, because this couldn’t be further from the truth. While I won’t go so far to call it the very most powerful fan in existence, I’ll certainly vouch for its capabilities when stopping to consider its overall level of noise. Simply put, it’s a lot more effective than it sounds. It also comes in a sleek design. I’ll even go out on a limb here and say that I think it’s the best fan on the market right now in this regard. Considering this is something which is going to be protruding from your ceiling for quite some time, this is certainly a nice characteristic to see. 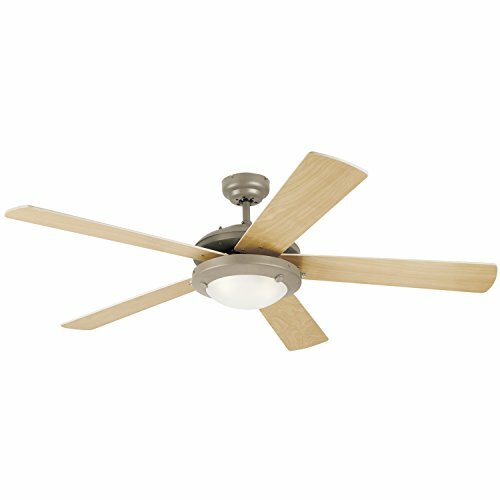 The Hunter Fan 59135 Key Biscayne is great in that it answers many of the common complaints many have expressed of their current ceiling fans. No matter who you are, the Hunter Fan 59135 Key Biscayne is an excellent choice every time. Now, as great as the above fan is, it’s safe to say that not all of us are able to spend nearly two hundred dollars on a ceiling fan. If you find yourself liking the fan in question, though simply cannot justify spending almost two hundred dollars for the privilege of owning it, you may find the Hunter Fan 59135 Builder Deluxe to be to your liking. This is because (as I’m sure you’ve already figured out from its name) the Hunter Fan 59135 Builder Deluxe belongs to the same line as the last fan we just covered, giving you another model from the same great brand, though without having you pay through the nose for the privilege. 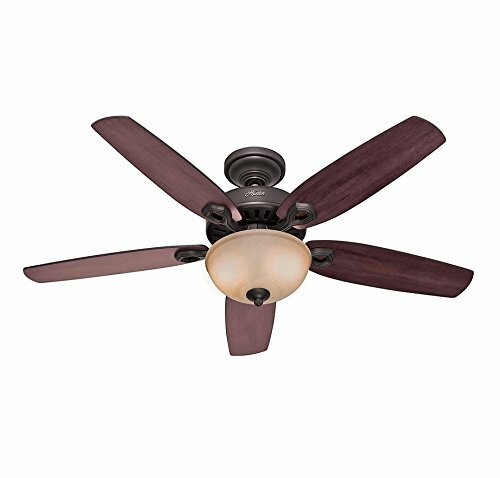 The Hunter Fan 59135 Builder Deluxe is similar to its more expensive counterpart in that it doesn’t make a whole lot of noise in operation. In fact, I’d wager the two fans are nearly the exact same in this regard. Of course, a fan’s noise level isn’t the only important factor to consider. Luckily, the Hunter Fan 59135 Builder Deluxe excels in nearly every other factor as well, especially when you stack it up to fans fitting within a similar price range. You’ll notice it comes with all of the practical features you might expect to find in a ceiling fan and then some, such as its dual light fixture, its reverse speed setting and even a lifetime warranty on the motor. The latter of the aforementioned features is easily the best, being that the motor is likely to be the first thing to break through no fault of the owner. If you like the quiet motors and excellent level of consumer protection offered by this brand, though simply cannot justify spending an extremely large amount of money, look no further than the Hunter Fan 59135 Builder Deluxe, which proves to be a great product at an equally great price. Perhaps, for whatever reason, you just can’t get on board with what the Hunter Fan brand is all about. If this is the case, don’t feel as if it is the only worthwhile brand in the world of fans. The Westinghouse 7801665 Comet, while clocking in at just under one hundred dollars, can prove to be a great fan when used in the right house and by the right owner. If there’s one area where you’ll immediately notice that the fan sets itself apart from other products on the market, its in its sleek-yet-unassuming design. While many ceiling fans come with a warm wood glow, it can be easy to get tired of these and want to opt for something a little different. If so, the Westinghouse 7801665 Comet is definitely what you want. Like the other two products we just covered, the Westinghouse 7801665 Comet comes with a lifetime warranty on its motor. Once again, this is great, being that you can be sure the fan won’t break for reasons which are out of your control. Unlike the other products; however, this particular fan also comes with a two-year warranty on the rest of its parts. Considering that this reaches well above and beyond the industry standard, it just goes to show that Westinghouse has a large degree of confidence in this product. The fan in question also preforms well by all standard metrics – it has a high wind output, it comes with several different settings and has a dual light fixture (which comes with two free lights). What more could you ask for? It goes without saying that each of the above three products are some of the best in the business. However, as great as this may sound, you’re still left in a position where you’ll need to decide between several different products. If you’re after a cheaper product which offers a great look and does an excellent job of covering all of the basics, you best bet is going with the last ceiling fan we covered – the Westinghouse 7801665 Comet. On the other hand, if you like the idea of a fan which produces very little noise while in operation, one of the two Hunter Fans might be your best. Which of the two you choose to go with will majorly be decided by how much you’re willing to spend. Is a sleek look worth one hundred dollars? There is no right or wrong answer, though it will be up to you to decide. There are a wide variety of different ceiling fans to choose from on the market, so don’t feel as if they’re your only viable options. By searching around, you can find a whole lot of fans which are suited toward your preferences. By keeping the below considerations in mind, you can sure to come out of your shopping excursion victorious. How many blades do you really need? If you’re like most people, you’ve become accustomed to seeing only ceiling fans which consist of five blades. However, believe it or not, a wide variety of fans can be had which only have four or even three blades. Generally speaking, a lower amount of blades will translate to a lower overall cost. On the other hand, it goes without saying that five blades will perform in a more satisfactory manner than three or four. As such, it’s entirely up to you to decide whether effectiveness or a low cost is more important to you. If it’s the latter, cutting down on the amount of blades you purchase is an excellent cost-saving measure. How many settings do you need? Once again, it can be easy to assume that every fan comes with the same amount of settings. This; however, is simply not true. Different fans may come with a variety of different settings. As I’m sure you can guess, opting for a fan with more settings will have you paying a higher price for the fan in question. As with a fan’s amount of blades, which number of settings is best all comes down to you. If you know you’re never going to use a reverse fan setting, why bother paying for one? On the other hand, if you typically use a variety of different settings on a fan, this is not a feature you want to skimp on, as you may find your fan to be much less able to tackle your needs if you do. How big is the room in which your fan will be mounted? This is another important factor to consider. If you’ve ever been in a stuffy or hot room whose fan seems to offer little in the way of relief even after having been running for a substantial amount of time, there’s a pretty good chance the fan in question just wasn’t equipped to deal with the size of the room. However, many fans’ manufacturers will give you some indication as to just how much open air their fan can handle at any one time. You can take their advice, or even go a step further if you’d like and only buy a fan which is made for an ever larger room than the one you plan on putting it in. Whatever you decide to do, it’s important to keep in mind that getting a fan which is compatible with your room is essential if you want to notice any substantial difference in your room’s airflow or temperature upon turning the fan on. Up until now, this buyer’s guide has been aimed at helping you decide what type of fan is best for you. Not most people, just you. This is because a ceiling fan’s worth will vary from person to person, depending on whether or not said fan is able to meet their needs. The below features; however, are always great to see in a fan. It never hurts to keep an eye out for them when shopping. A Motor Warranty – Assuming you’re not mistreating it, when your fan’s motor breaks, it is through no fault of your own. As such, you shouldn’t have to worry about it breaking. For this reason, any fan worth it’s salt should come with some sort of motor warranty. Warranties on any other parts should simply be considered an added bonus. A Sleek Look – This is something many people forget to think about when shopping for a fan, as many of us have grown used to only looking at a product’s specs and user reviews. While looking at these is certainly important, you should remember that this ceiling fan will quite possibly be the key focal point of your room. If you wouldn’t buy sloppy-looking couches, you definitely shouldn’t buy a sloppy-looking ceiling fan. Of course, whether or not a fan looks good will be entirely up to you. Outside of making a point of finding a fan which exhibits the above features, it’s a good idea to carefully consider just what it is you need in a fan. While looking at user reviews should always be on the top of your priority list, it’s important to remember that everyone is different and lives in a different house, making any given fan more or less effective for one person than another.